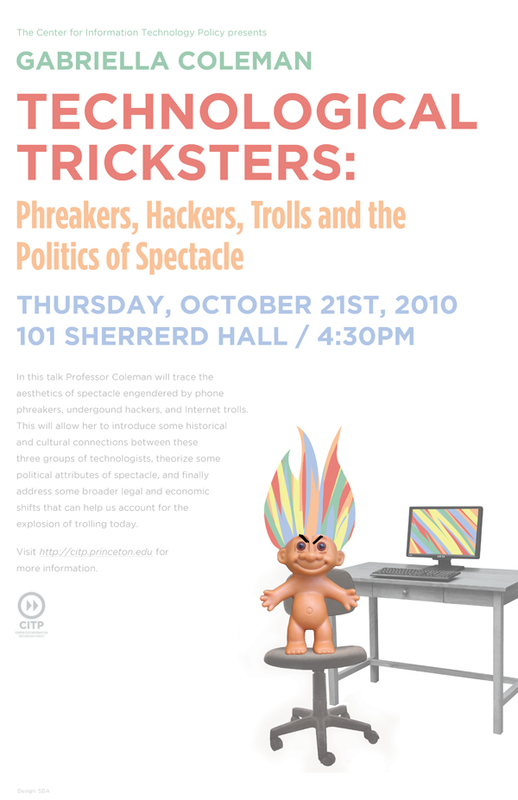 Professor Coleman will trace the aesthetics of spectacle engendered by phone phreakers, underground hackers, and Internet trolls. This will allow her to introduce some historical and cultural connections between these three groups of technologists, theorize some political attributes of spectacle, and finally address some broader legal and economic shifts that can help us account for the explosion of trolling today. Trained as an anthropologist, Gabriella (Biella) Coleman examines the ethics of online collaboration/institutions as well as the role of the law and digital media in sustaining various forms of political activism. 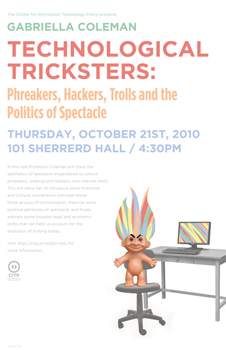 Between 2001-2003 she conducted ethnographic research on computer hackers primarily in San Francisco, the Netherlands, as well as those hackers who work on the largest free software project, Debian. She is completing a book manuscript “Coding Freedom: Hacker Pleasure and the Ethics of Free and Open Source Software” (under contract with Princeton University Press) and is starting a new project on peer to peer patient activism on the Internet. She is the recipient of numerous grants and awards, including ones from the National Science Foundation, the Woodrow Wilson Foundation, the Ford Foundation, and the Social Science Research Council. She is on leave during the 2010-2011 academic year at the Institute for Advanced Study in Princeton, NJ.